Rest assured, taking care of synthetic hair (including synthetic extensions and synthetic hair wigs) is incredibly easy, and I’ll walk you through my basic washing routine and what products I use to keep my synthetic hair pieces looking good as new. Tips and trick to come, but this should get you started. I wash my hair pieces about every two weeks. Towards the end of their lives (sounds macabre! ), I find the need to wash more often, about one time per week. But, you should be able to get about two weeks out of a wash. Since the hair is fake and not actually attached to your head, it doesn’t get oily and dirty. In face, the only part of the synthetic topper or wig that might get dirty is the base/cap (the part that actually touches your scalp). Some may find they can go longer between washes; once my pieces start to get tangly, straw-like or clumpy, I know it’s time for a wash. I still use the first wig shampoo I ever bought, which is Revlon Texturizing Shampoo for Synthetic Hair. It’s a basic shampoo, but what I like about it is it removes a bit of the synthetic shine that many synthetic wigs and toppers have. Moreso than other shampoos, for whatever reason. For conditioner, the corresponding Revlon conditioner did NOT work for me, and left my pieces feeling coated. Yuck. I tend to rotate between two conditioners: Enjoy Sulfate-free Hydrating Conditioner (this one was recommended to me for use on human hair pieces by a hair loss specialist a few years ago; it can be used on bio hair, too) and my regular Nioxin conditioner that I use on my own hair. Both of these conditioners smell great (Enjoy is very fresh-smelling, and the Nioxin is slightly minty) and leave the hair so soft and swingy. I like that both can also be used on bio hair–I feel I am getting more bang for my buck that way. I’ve tried a few other drug-store brand conditioners and they don’t leave my hair as soft as these two. Pinching pennies? Many women SWEAR by using any old shampoo or even laundry detergent on their synthetic pieces. Yes, laundry detergent! Likewise, fabric softener is the conditioner of choice for some. I tried this once, and I ended up smelling like Snuggle Bear for a few days (something about my hair smelling like linen didn’t work for me). If you can find an unscented version it’s definitely worth a try to see if it leaves your hair as soft as you’d like. For me, I found the hair to be a bit dry. This part is really simple. First, brush out the synthetic hair thoroughly. You’ve seen this brush in my “integrating my topper” video: I LOVE the Tangle Teezer brush. It’s great on both synthetic hair pieces (it’s so gentle) as well as bio hair. Step 1: Fill a container/sink/something with cold water. Any container will do–check out my Easter basket-bucket-thing below! Water should always be cold with synthetic hair–using hot water can alter the style (pull out curls, take out swing, etc.). Step 2: Add a squirt of shampoo into your container as it’s filling and allow bubbles to form. Step 3: Place your piece into the water and swish it through, allowing the suds to work through it. Be gentle and don’t comb through it with your fingers. Doing so can do the same thing hot water can–it can alter the style. Step 4: Allow it to sit awhile. I generally leave it in there for about 10 minutes, but sometimes a few hours if I forget. Oops. Step 5: Remove your synthetic hair from the basin and rinse it gently under cool water. Always rinse in the same direction as the hair lies. Don’t wring it! Step 6: Dump out the water, and refill your basin with clean water. Squirt a generous amount of conditioner into it. Swish your piece through the water. Step 7: Allow it to sit for at least 30 minutes–you can leave it overnight if you want. Step 8: Remove and gently rinse. Again, don’t wring it. You can carefully squeeze out excess water once you are done rinsing. Step 9: Lay your synthetic wig or topper onto a large bath towel and fold the towel over and around it. I know it sounds crazy, but step on the towel to remove all the excess water. This accomplishes the same thing wringing does, without ruining the wig style. Step 10: Hang your hair piece up to dry. I usually clip a hanger to its tag, and hang it upside-down in the shower. Synthetic hair dries much faster than human hair. Usually it’s good to go in 3-4 hours (and I have a long piece). Typically, however, I wash my pieces at night and hang to dry overnight so that they are ready to go in the morning. Is a Leave-In Conditioner Necessary? Not necessarily, but I use one out of habit. Try it without for awhile and see what you think. I do think if you get the right one, it coats the hair in a way that leaves it with better movement, longer. I use Velvasil Conditioning Spray. Unlike many leave-ins, this doesn’t leave ANY buildup. Buildup is especially bad for synthetics because it can cause clumping, so I definitely keep this in my arsenal. Once your synthetic hair gets a bit older, you’ll find it needs to be washed more often. Sometimes a simple rinse under cool water and a few spritzes of Velvasil is enough to revive mine for another week. What do you think? Easier than you thought? 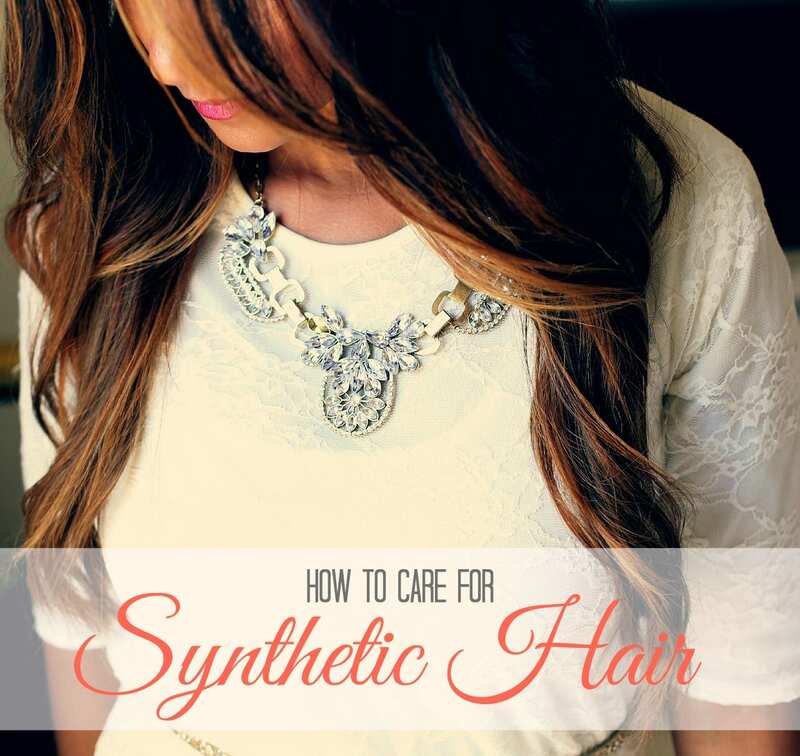 Taking care of synthetic hair is so easy, and the beauty of it is once it’s dry, you gently comb through it, give it a bit of a shake, and it looks brand new. Too bad we can’t say the same about our bio hair, right? « This post is for you. Yes, YOU. I’ve had my current bottle (jumbo!) of shampoo and conditioner for around 18 months – you can see it in some of my selfies here on the site. It is never-ending, which is nice on the pocketbook. In terms of effectiveness – I did notice an immediate perceived difference when I started using it. My hair looked fuller, albeit slightly. I can’t say for certain that it “fixed” any part of my hair loss, however. I am a strange case since I don’t shed a ton, but my hair miniaturizes very quickly (until it doesn’t grow back). I like it as a shampoo for my bio hair and it does quite well on my synthetic pieces, too. There are a few out there – have you seen Top Level? Do you use the leave-in conditioner in addition to the regular conditioner? Or, if you use a leave-in does that mean you would just shampoo and omit conditioner in the bucket? I have not used Nioxin… there are several different products with numbers… which shampoo-conditioner system do you recommend for synthetic hair and keeping it soft? I only used the Nioxin I had on-hand on my synthetics because, well, it was on-hand (I have number 4). The last two products here are what I use, mostly. Hi there so glad that I found your blog? I bought my first wig it is long wavy and now it is so tangled… I tried making a spray to detangle it : water & fabric softener but it didn’t work… now you said I should first brush the wig before washing but my problem is I cannot brush it cause it is so tangled and i am afraid that it will loose the waves when I comb it… so I don’t know what I should do also the “hair” feels sooo stiff now? Is it synthetic? I’m presuming so. Just go ahead and try to brush it the best you can – you might find a brush like the Tangle Teezer or a pik works best. I’d recommend (either before brushing or after if you simply can’t do it) a soak of an apple cider vinegar/water mix… use about a 1/2 to 1 ratio of ACV to water and let it sit for several hours, if not overnight. It will definitely help go forward, and may help with the existing tangles if you can’t brush through, first. I agree, wigs and toppers can get so stiff, and this helps! Yes synthetic! and after I tried to brush it, the waves started to disappear so I didn’t brush it more…if I wash the wig before brushing will the tangling get worse?? I’m not sure – you’ll have to be really gentle with it and just swish it delicately through the water. It doesn’t sound like it can get much worse, though, so you don’t have much to lose. So I washed my wig with detergent and some fabric softner it no longer feels soft instead it feels like there is a thick residue left over idk has anyone else had this problem? I’m not too big a fan of this method – you may just have to re-wash.
Do you have any advice for dry, frizzy ends on a synthetic wig? My wig is only a month old and the ends are damaged. I do not wear it while cooking. Have been using Estetica care products. Help! Thank you. Yes! I’d recommend a hot air brush to help smooth those out. I did a post on smoothing dry, frizzy synthetic hair that you may find helpful! 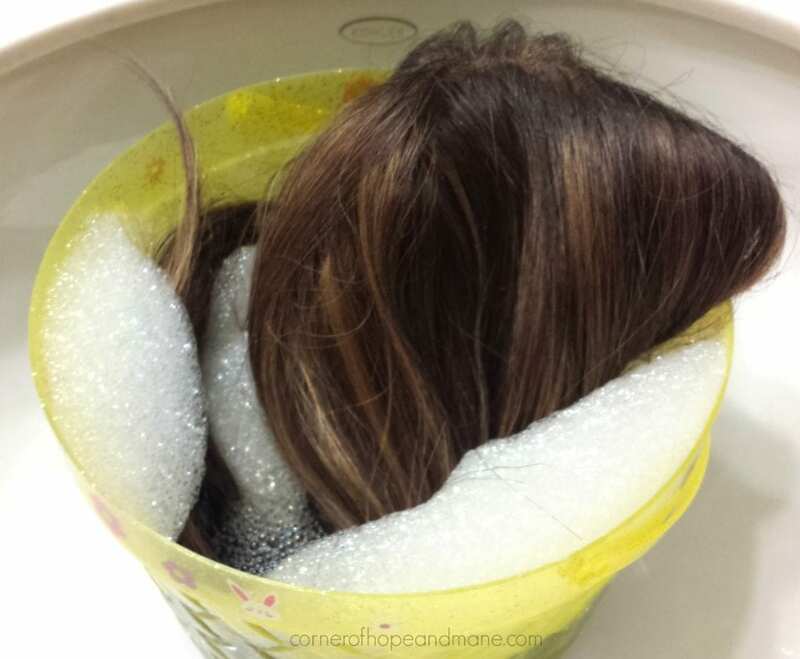 Can I use shampoos for babies instead of any of special wig shampoos for my synthetic wig? Sure, you can really use anything. Regular shampoos and conditioners will work on synthetics? What about leave in? For the most part, yep! I haven’t tried TOO many, just what I’ve mentioned in the post. For leave-in, for favorite is: HairUWear Restore. I used to have it in my Products I Love section on the site, but it got hard to find because it was being repackaged. I’ll have to re-add it now that’s it back! !